This is a first in so many ways! 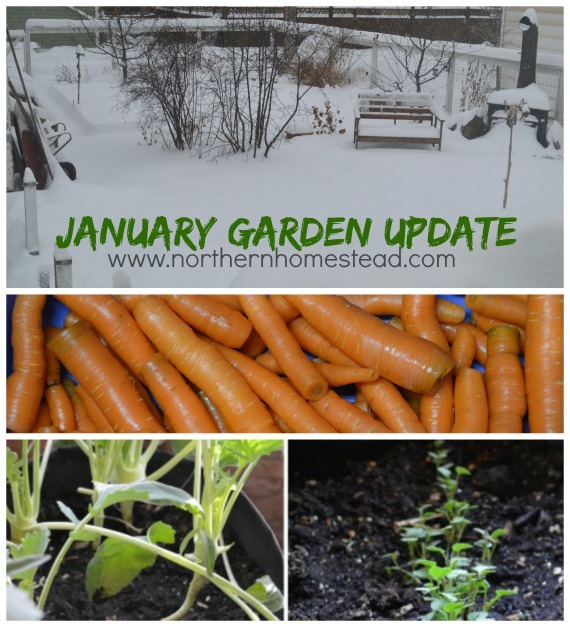 Of course, it is the first garden update in 2015, and also it is our first garden update in January, ever! A winter growing experiment in Zone 3, the first harvest for us in the middle of the winter, and the beginning of a new growing adventure with hydroponics. This winter has been really good, lots of sunny and nice days. In fact, it is unusually warm at the moment, and we do enjoy the break from winter. The coldest temperature we had this winter, as far as we remember, was – 34ºC (-29.2ºF). No, it is not -40. So our experiment to harvest in the winter is not totally true to Zone 3. But still, impressive. 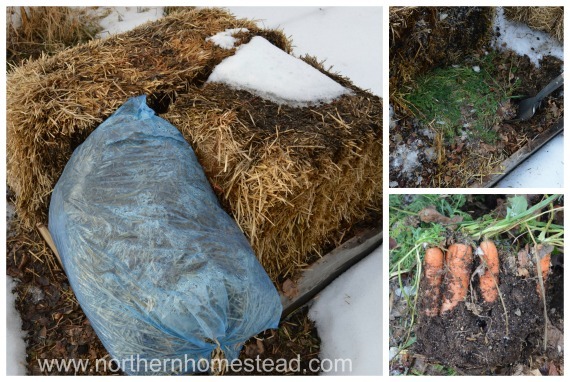 After the fall harvest, we left some carrots in the ground and covered them with straw. The plan was to harvest them sometime in the winter. We were very curious to see how much frost the carrots would handle. We left some carrots in the raised beds covered with straw squares. We thought this would be well protected. But it was not. This place is open in the garden, so the snow was not deep here and melted as soon as we had some warmer days. The melting and freezing again turned the straw to ice blocks. It was hard to get the straw squares off the ground. Still, some of the carrots were fine, some were frozen. Maybe we should have covered the straw with plastic to prevent it from getting wet and frozen. We had some more carrots that were covered with bags filled with straw. This area also had a lot more snow drifted on it. The snow helped to insulate. Here we got more good carrots, even though some got rotten – frozen tops. We think that the plastic right on top hindered them from breathing. We did not harvest all of the carrots just yet. We are leaving them to see how much longer carrots can stay fresh in the ground. All in all, we got a nice harvest of crunchy and fresh winter carrots. 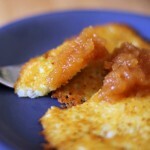 The taste is a bit different from summer carrots – sweeter. But also different from the fall carrots we harvested in November – they almost taste a bit watery, still much better then any store bought carrots though. 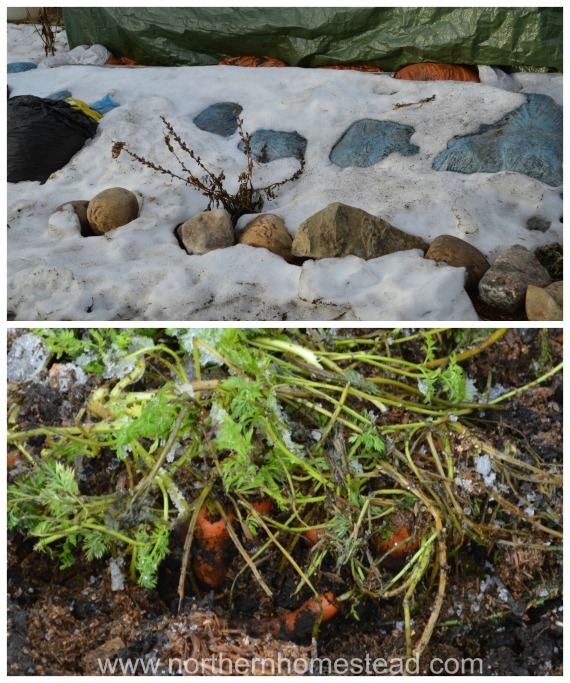 If you have experienced harvesting winter carrots in extreme cold, please share – we are all learning here together. We also left some kale covered with two layers of Frost Blanket s. We did not bother to build a hoop, so the snow just covered the plant and the blanket gave it even more protection. I harvested most of it in November but left just enough to see what will happen with the rest. 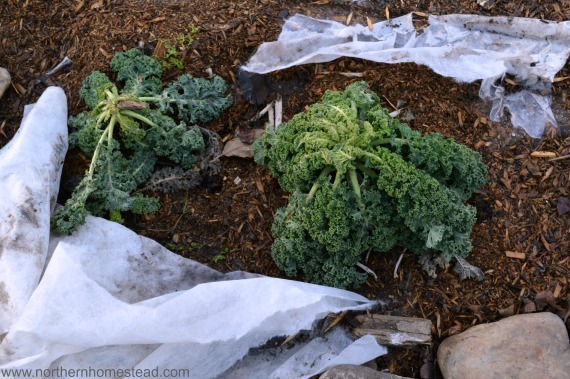 The covering was frozen to the ground, so we had to rip it to get to the kale. The kale looked green but was limp. No Kale in January in Zone 3 :(. In the garage – greenhouse we still have plants “growing”. As you know, this is our first year, so the experiment has been very interesting. We could really see the impact the “below 10 hour days” have. From October 28 till February 14 our daylight is less than 10 hours. We are still two weeks away from when our days will be 10 hours long. 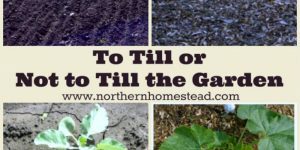 Calculate your garden’s “below 10 hour days” days. Here a picture comparison of some plants in the greenhouse. In two months there was no growth worth talking about. No, it was not too cold for these plants to grow, it was too dark! By dark I do not mean the lack of sunshine, we have lots of sunny days here, but just not enough sun hours to grow. The plants look healthy and as soon as the days will get longer, they will take off. Knowing this, we have to plant earlier in the summer, so all the plants mature by the time our days are too short to grow. We could then harvest fresh produce all throughout the dark months. That is the way most winter gardening in warmer zones is done outside. And we could add lights, and GROW all through the winter since the coldest it got in the greenhouse was only -5 °C (23°F). See how we kept the greenhouse from freezing. We are starting a new adventure of growing all winter long hydroponically. We ordered the tower garden, an aeroponic vertical gardening system. Plants in aeroponic grow faster and with added lights can be grown anywhere and all throughout the long winter months. See this impressive 4-week time-lapse. We will keep you posted on our garden and greenhouse growing. Thank you for your interest! Wow! That tower garden was very impressive! I look forward to seeing how you did all this! Me too, I have seen so many videos how great the tower garden grows. We will share how our tower garden will actually grow. Do you know how many watts it takes to run the tower garden? 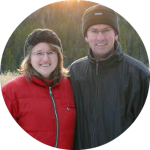 We are on solar and power is at a minimum during the winter because of short days. We have trouble already keeping everything running. The 2 hogs are the freezer and the chicken water heater. 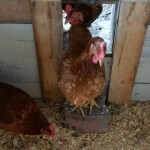 When the chicken heater dies, we are thinking of not replacing it like we did when the goat water heaters died. I am just trying to figure out if this is feasible with our limited winter power supply. It runs on a low wattage 15-watt submersible water pump. Off-grid solar powered Tower Gardens are common. Stephen, we are buying the tower garden. 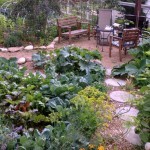 We did make plans to build one, but it is hard to find all food grade things to build the garden from. So we decided for now to get one that is already made out of food grade plastic and not mess around with questionable parts. Thank you! Winter gardening is a whole new world of gardening. That is great, Margy. It is a lot colder here, so we have to cover. And you are right, it is nice to be able to harvest in winter. Thanks for the post. I will try your carrot trick. 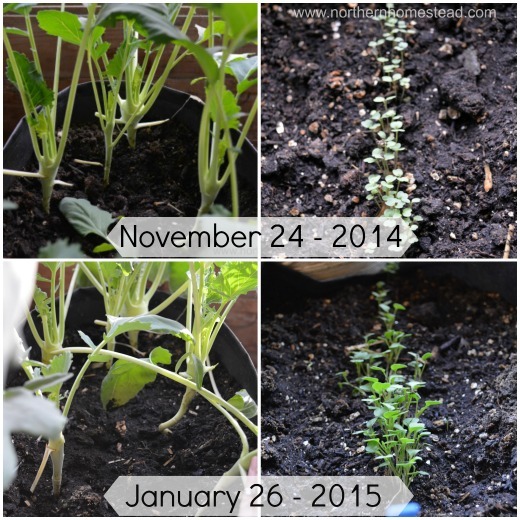 To share – last winter we left all our kale (20 plants) in the ground and just let them freeze in the snow. We harvested them all winter by using a shovel to dig them out (mark where they are with a tall stick – if you aren’t careful the leaves all snap). Once the leaves thaw, it was almost like fresh kale. Not crunchy, but good in smoothies and soups. We are in northern Quebec, so zone 3 and were digging the plants from a metre of snow. Good luck! Good to hear it works so well for you, thank you for sharing. Snow is a great insulator (in fact the best). Here in Alberta we have to cover, since we have (depending on a year) very little snow. 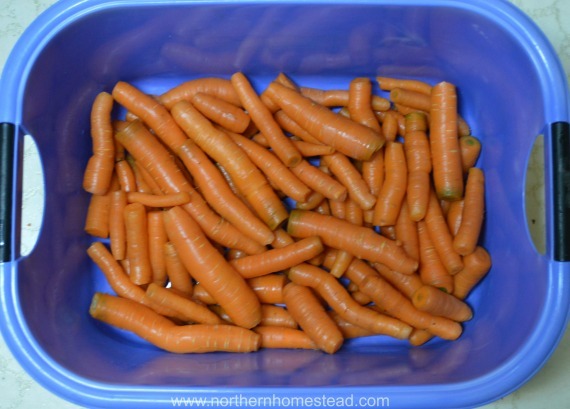 I just finished canning the last of my winter carrots. Very sweet and tender. No winter protection but only had soft spots on those that the rabbits and voles dug and pigged out on. (that’s why I dug them all up) Those that survive the winter, carrots that is, will go to seed. I’ve grown the same variety for so long I don’t even know what variety they are. Maybe I should try a winter crop in the greenhouse. Thanks for the great article. You are welcome. 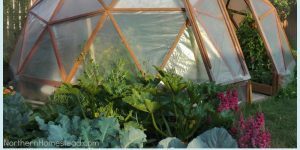 It sounds like you could grow a winter crop in the greenhouse. However, depending how far north you are, you have to start very early. 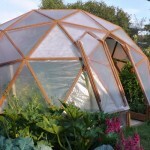 I find the same greenhouse for summer and winter crop does not work. 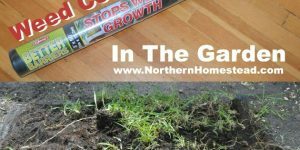 It’s either used in the summer or in the winter (with planting time in the summer, that is). As always, I’m inspired. I had to laugh at your “mild” winter of only -34C (that is crazy cold!). I love what you are doing and how you are not letting your climate define you. As I’m working on our spring/summer plan I’m going to try something new and use shade cloth once we reach 95F. I am ok with -34C once in a while, but not ok with +34C. So you are the tough one ;). Shade cloth should work great for you. Your tower garden looks great. Where did you put it and what are you using for light? 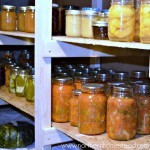 I’m growing in the house with hydroponics and have been eating greens and herbs all winter. Now I’m experimenting with peppers and tomatoes. The plants have grown well and are flowering. I messed up with the peppers and grew a variety growing too tall for my lights but the tomatoes are a dwarf heirloom cherry and are only about 9″ high. It is not my tower garden in this video. We order the tower garden with lights, since it is to dark here too. Great to hear that you can grow all winter long in the house. That’s what we plan to do too. I hear tomatoes do well in the house. Good idea to stick to dwarf plants. I’m so happy you’re experimenting in such a cold and short growing zone. I think you’re doing awesome!! Have you experimented with spinach or mache yet? I *might* break my heirloom growing to try some of the more winter hardy hybrid kales next winter. I’ve found they can handle -15C unprotected but past that they become too damaged. I’ve also found that the larger the plant, the worse they handle the winter so I’m going to try the low tunnels full of baby kale and chard etc to see if that makes a difference. I also want to buy the Gro-Guard that Cathy from Mother of a Hubbard uses for this upcoming season! Thank you for your kind words. I do have spinach in the garden. Not covers, just mulched and cut back. Last time I checked it looked alive and will come back as soon as spring comes. We get far below -15C though. I am happy to have greens in the greenhouse. Well dang it….now I’m sorry I pulled those carrots out before they froze in the fall! Next year I will be insulating them instead. We get snow here and there through December but it doesn’t get ‘way too frozen’ till January. I’m guessing that with your method I can extend the season another month or so. 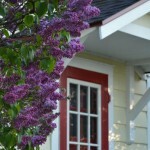 You can definitely extend your growing season. Depending on where you live, down to growing Zone 5 (-15F) with some protection harvesting all winter long is possoble. Thank you Ann! To start early enough is a challenge for short seasons. I am curious about the kale. I know someone else mentioned letting it freeze, but I have another thought. You said the leaves were limp – All winter I buy lettuces from the grocery store for our guinea pigs and myself. Often, I’m there at the end of the day and all the lettuce is sad and wilted. When I get home I add some cold tap water to the bottom of the bag (just enough to fill one corner), twist the top tight (so it doesn’t leak), and put it into the fridge. The next evening it’s usually like new – you can’t even tell! I know the same works with lettuce from my garden, after not making it down to my community plot to water into slightly too late I’ve brought back a LOT of leaves that way. I bet if you had harvested the kale and floated it in a sink of cold water (maybe even with some ice cubes to prevent it from heating up too quick) you could get it to crisp back up, at least a bit. This is a great tip, thank you.